Orissa was one of the regions of northern India that continued longest to produce sculpture in stone and bronze [see EA1980.64] which was both original in conception and of a high degree of technical competence. The adjacent region of Bengal had introduced during the later Pāla period the technique of cutting away all the stone ground around the body and head of an image. Here the process has been carried to the extreme so that what remains of the ground more nearly resembles the halo (praghāmaṇḍala) surrounding a metal image, except for a flat top with the head of a god projecting beyond it. The head is a fine example of inventive caricature, hardly leonine at all, with its hook nose and upturned moustaches. 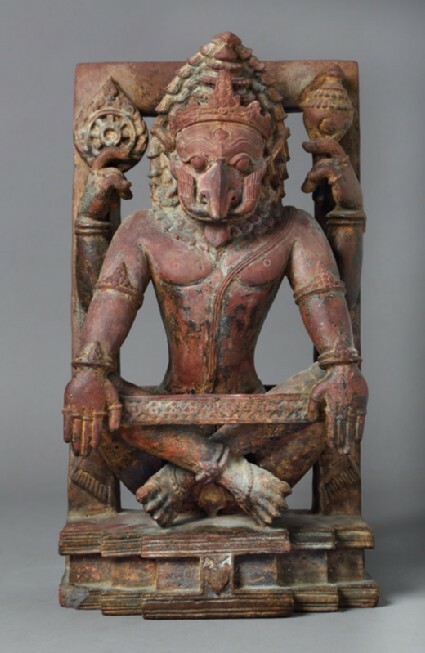 A very similar lion-head can be seen on the superb ivory throne leg from Orissa, now in the Seattle Museum of Art, similarly monstrous but with the same mad geniality, the Indian sculptor invariably treating even his most grotesque creations with sympathy. The man-lion’s mane is shown, in a delightfully fanciful way, cascading down in a series of ringlets on either side of his crown. The god sits cross-legged in the yogāsana position (sometimes called utkuṭaka), with a band to hold both knees. His lower hands are stretched forward and rest on his knees; his upper ones hold the discus and the conch as befits an incarnation of Viṣṇu. This “single” (kevala) image of Narasiṃha is comparatively rare. Far more common are those showing the man-lion disemboweling Hiraṇyakaśipu, one of the most terrible of the Daityas.